If you haven’t had the chance to taste a find Madeira, you’re missing one of life’s rare joys. The creamy full body, nutty, citrusy and calming beauty of this historic fortified beverage can lift the end of an evening into romantic contemplation. It was during the birth of the United States over 200 years ago that Madeira was most popular. The founders’ favorite beverage was often a good Madeira, which at the time was one of the rare wines that could withstand the long journey across the Atlantic without spoiling. 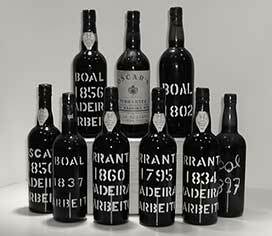 Madeira doesn’t spoil because it is a fortified wine, like Port wines. As the wine ferments (as yeast turns sugars to alcohol), at an opportune time during the process the winemaker fortifies the wine with brandy to bring the alcohol percentage up to about 20%. This kills the yeast while some sugar remains, leaving a high-alcohol and sweet wine. Port wines are aged in barrels or bottles. Madeiras, by comparison, are aged in large vats, at higher temperatures, which draw out citrusy flavors and the unique character Madeiras exhibit. We’ll be sampling Madeira at our Port Weekend Event at the end of February! See our Events Calendar online for more information. Today, the Rare Wine Co. is one of the few companies still importing Maderia, and is most certainly the source of the best Madeiras available in the United States. Less expensive brands including Feist and Broadbent are also available from other distributors, bringing a full selection and range available for customers at Salut!